On the Go? Take Generac with You. With a range of power options from 1800 to 17500 WATTS. 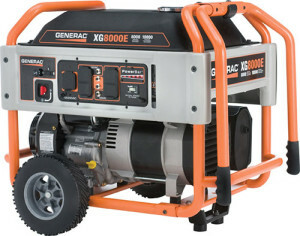 Generac has an affordable, reliable portable generator for your application. Steel fuel tank with incorporated fuel gauge monitors fuel usage at a glance. The premium quality power and reliable performance of Generac’s XG Series comes from Generac’s OHVI® engine. Depend on this rugged unit to provide years of reliable power to your event or job site. Heavy duty, hardened steel tube cradle, full-wrap frame tubing and impact resistant corners for durability. The undisputed workhorse of the portable market, Generac’s professional grade XP portable generators are engineered specifically with contractors and construction sites in mind. True Power™ utility quality electrical output for sensitive electronics. Large Capacity Steel fuel tank with incorporated fuel gauge. Locking fold-down handles & heavy duty wheels for portability on rough terrain. Super Quiet & Campground Friendly Full enclosure drastically reduces noise. FlexPowerTM for Operation Mode Options High mode- for large loads or battery charging Eco Mode- to save fuel and reduce noise even more. Engine Protection Low-oil shutdown detects low oil level and shuts the engine down to prevent potential engine damage.